After a decade of ongoing, gradual evolution, ICANN’s new gTLD program was started, signaling to Keren and his partners that “the old fashioned way of treating the problem will not work.” So a period of rapid development ensued, resulting in the debut and spinoff of BrandShield in 2013. BrandShield offers an application which crawls the deep web–behind paywalls, within websites–and uses natural language processing to examine, assess, and report threats. “Google’s searches cover just four percent of the web,” Keren said, explaining that BrandShield’s searches cover many times that, in English, and in some Asian scripts as well. 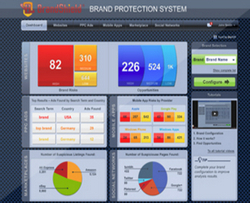 Understanding that a brand’s identity and intellectual property are of great value to even small brands, BrandShield works with its clients to create automated, customized alert levels. Keren says that its services can be tuned to provide value to even the smallest of companies. “Sometimes the small companies are the ones receiving the most abuse,” he said, adding that smaller companies can be the ones with the most to gain, and gave an example of a client–a small company owning and selling its patented product on Amazon for less than a year and, using BrandShield, discovering counterfeits being sold all over the world. The BrandShield engine is able to perform analysis on a threat in addition to discovering it–whether it is a high-ranking or low-ranking threat, among other data points. And it ranks threats according to a pre-set prioritization algorithm based on the preferences of the brand manager. Defining threats according to priority means that low-harm infringements will be given a low priority, for example. “When there are ten-thousand occurrences of infringement, you have to focus on the most damaging ones,” said Keren. Keren says clients appreciate the learning capability of the machine–it tunes itself to the brand’s preferences and makes recommendations using the brand manager’s prior actions as inputs. “They also like having visibility that they never had before, and seeing the patterns and the networks of the abuse, and having the ability to prioritize,” Keren said. BrandShield’s approach is married to its philosophy, which is that, respective to the client company’s size and budget, the imperative should be to manage a reasonable portfolio, and then monitor the rest. This goes for trademarks, copyrights, use of brand collateral, counterfeiting, and other forms of brand abuse. Over the years, some brands have equated protection with actions against domain registrants registering similar or exact matches to their trademarks, spending much time and energy and effort to force a registrant to release a name. Keren calls this nonsense. BrandShield still works with companies that don’t agree with Keren’s philosophy for brand protection, although Keren says he tries to get clients to “focus on the ones that could potentially cause the most damage,” as a better way to prioritize protection efforts. Good points! Content is King! If someone took the trouble of misusing your brand name/trademark within the content of a website, whose domain name has nothing to do with your trademark/brand, then those are the ones you focus on as a priority. If Brands start to pull their forces internally to include marketing/legal/IT to take a unified approach to brand enforcement, it will be a more effective effort all around. Brand enforcement should be the responsibility of the entire company, not just the legal team. Progressive minded brands, who know how fast the Internet is moving, get it (usually). Hopefully, their brand management service providers provide them with thought leadership in this space and not just look at them as “cash cows” alone. Measuring risk and prioritizing options – that’s the way to go, whether the number of preemptive / corrective registrations be large or small.